The other day I had to take a train up to our San Francisco office for some meetings. As usual I chose a window seat so I could capture the fleeting landscape. Interested in how I approach sketching on the go? I walk through my process in my Craftsy class, Urban Sketching in 15 Minutes a Day. Check it out. Right now, you can fave your most-wanted classes on the site to unlock Black Friday pricing -- how fun! 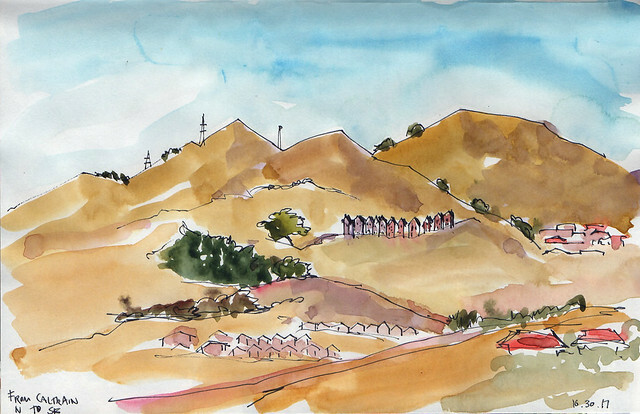 Sign up for my online class, "Urban Sketching in 15 Minutes a Day" on Bluprint. I am an editor, writer and artist who enjoys exploring the world and capturing its moments in various media. Follow me on Facebook, Twitter and Instagram.